By the beginning of World War Two, the disappearing guns originally installed on the upper reservation of Fort MacArthur were considered to be obsolete due to a lack of range and overhead protection. 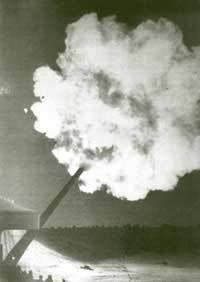 As far back as 1932, the US Army had begun experimenting with the idea of using a number of surplus 16" navy guns for coast defense. Over the next ten years, a number of prototype batteries were constructed in both the United States and Panama. The end result was a standardized design that could be built almost anywhere the army needed from a standard set of blueprints that needed little modification based on local terrain. 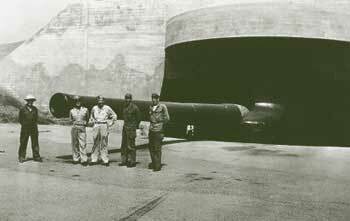 Battery construction project 127 began at the Whites Point reservation in April of 1942.Two huge concrete gun emplacements were built at a cost of 1.2 million dollars. The new battery featured such improvements as both radar and optical fire control, substantial overhead protection, and two 16 inch 50 caliber Mark II naval guns. The new battery had a range of over 26 miles and the fort now had the ability to cover the entire northern approach to the Los Angeles Harbor. An identical battery of this design was built at the Bolsa Chica reservation, Battery 128 was intended to cover the southern approach but that battery was never armed before the war ended. War Department General Order 51 issued on June 10, 1946 officially changed the name of the battery 127 to honor the memory of Colonel Paul Delmont Bunker. Colonel Bunker was a member of the organized reserve corps of the Coast Artillery at Fort MacArthur from 1937 - 1940. Colonel Paul Delmont Bunker (1861-1943) a graduate of the US Military Academy at West Point class of 1903. Paul Bunker is considered an immortal in the game of football at West Point. He was twice named to Walter Camp's All American Team in 1901 and again in 1902. The competitive and determined spirit that drove him on the field was symbolic of his attitude thought his military career. It was said that Paul Bunker loved life and worked hard to live it thoroughly. Paul Bunker returned to the United States in 1937 and was assigned to the Organized Reserve Corps of the Coast Artillery at Fort MacArthur. Even though he was not due for foreign service again in 1940, the opportunity was presented to return to again command the 59th Coast Artillery Regiment at Fort Hughes. Over the next two years, he worked to strengthen the islands defenses, and train both US and Philippine forces for the inevitable conflict. Colonel Bunker was taken prisoner by the Japanese on May 6, 1942 and was held in a Japanese prison camp until he died of starvation and disease on September 7, 1943. He is buried in the cemetery at West Point. Content � 1994 - 2013 The Fort MacArthur Museum Association. This web site has been prepared and is maintained by the Fort MacArthur Museum Association. We welcome email asking for additional museum and historical information. Comments or suggestions concerning this web site should be addressed to the webmaster. The opinions expressed in Fort MacArthur Association publications are those of the Fort MacArthur Museum Association, contributors, and members. They do not necessarily reflect the views and opinions of the City of Los Angeles Department of Recreation and Parks or any individuals employed by any department of the City of Los Angeles.